Brecon (; Welsh: Aberhonddu [ˌabɛrˈhɔnðɪ]), archaically known as Brecknock, is a market town and community in Powys, Mid Wales, with a population in 2001 of 7,901, increasing to 8,250 at the 2011 census. Historically it was the county town of Brecknockshire; although its role as such was eclipsed with the formation of the County of Powys, it remains an important local centre. 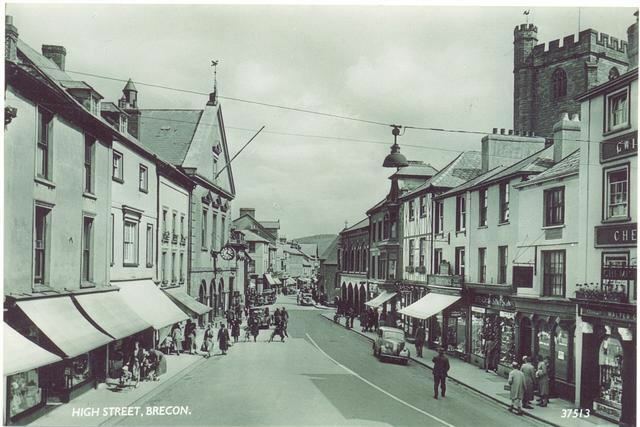 Brecon is the third-largest town in Powys, after Newtown and Ystradgynlais. It lies north of the Brecon Beacons mountain range, but is just within the Brecon Beacons National Park. The Welsh name, Aberhonddu, means "mouth of the Honddu". It is derived from the River Honddu, which meets the River Usk near the town centre, a short distance away from the River Tarell which enters the Usk a few hundred metres upstream. After the Dark Ages the original Welsh name of the kingdom in whose territory Brecon stands was (in modern orthography) "Brycheiniog", which was later anglicised to Brecknock or Brecon, and probably derives from Brychan, the eponymous founder of the kingdom. Before the building of the bridge over the Usk, Brecon was one of the few places where the river could be forded. In Roman Britain Y Gaer, Brecon (Cicucium) was established as a Roman cavalry base for the conquest of Roman Wales and Brecon was first established as a military base. The confluence of the Honddu and the River Usk made for a valuable defensive position for the Norman castle which overlooks the town, built by Bernard de Neufmarche in the late 11th century. Gerald of Wales came and made some speeches in 1188 to recruit men to go to the Crusades. Brecon's town walls were constructed by Humphrey de Bohun after 1240. The walls were built of cobble, with four gatehouses and was protected by ten semi-circular bastions. In 1400 the Welsh prince Owain Glyndŵr rose in rebellion against English rule, and in response in 1404 100 marks was spent by the royal government improving the fortifications to protect Brecon in the event of a Welsh attack. Brecon's walls were largely destroyed during the English Civil War. Today only fragments survive, including some earthworks and parts of one of the gatehouses; these are protected as scheduled monuments. About 250 m (270 yd) north of the castle stands Brecon Cathedral, a fairly modest building compared to many cathedrals. The role of cathedral is a fairly recent one, and was bestowed upon the church in 1923 with the formation of the Diocese of Swansea and Brecon from what was previously the archdeaconry of Brecon — a part of the Diocese of St David's. Saint Mary's church began as a chapel of ease to the priory but most of the building is dated to later medieval times. The West Tower, some 27 m (90 ft) high, was built in 1510 by Edward, Duke of Buckingham at a cost of £2,000. The tower has eight bells which have been rung since 1750, the heaviest of which weighs 810 kg (16 long hundredweight). In March 2007 the bells were removed from the church tower for refurbishment. The church is a Grade II* listed building. The Church of St. David, referred to locally as Llanfaes Church, was probably founded in the early sixteenth century. The first Parish Priest, Maurice Thomas, was installed there by John Blaxton, Archdeacon of Brecon in 1555. The name is derived from the Welsh – Llandewi yn y Maes – which translates as St. David’s in the Field. It is probable that the site and the name of the present Church were chosen because of the close proximity of a fresh water well called Ffynnon Dewi (David’s Well) which was situated approximately 150 metres south of the church. Plough Lane Chapel, also known as Plough United Reformed Church, is a Grade II* listed building. The present building dates back to 1841 and was re-modelled by Owen Morris Roberts and is considered to be one of the finest chapel interiors in Wales. Today Brecon is a thriving community and is popular as a holiday destination, being on the northern edge of the Brecon Beacons National Park, affording among the best views of the Brecon Beacons themselves, a range of hills, including Pen y Fan, the highest point in southern Britain at 886 m (2,907 ft). 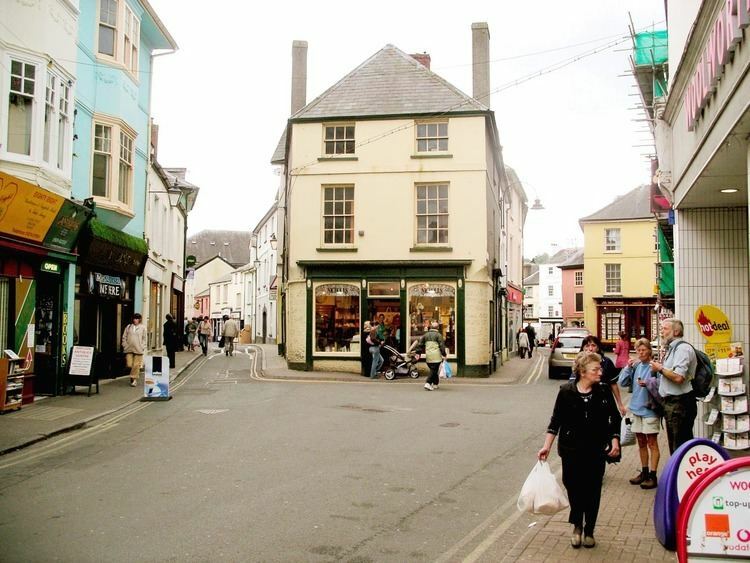 The latest Powys County Council (2011) estimate of the population of the town is 8,020. The town has a statue of Arthur, Duke of Wellington, as well as other statuary in Brecon Cathedral, by Welsh sculptor John Evan Thomas. The Barracks, Brecon, home to 160th (Wales) Brigade. Gurkha Company (Mandalay) is based here. Approximately 9 miles (14 km) to the west of Brecon is Sennybridge Training Area, an important training facility for the British Army. The west end of Brecon has a small industrial area, and recent years have seen the cattle market moved from the centre of the town to this area, with markets held several times a week. Brecon has primary schools, with a secondary school and further education college (Coleg Powys) on the northern edge of the town. The town is home to Christ College, the oldest school in Wales. Brecon is located near where the east-west A40 (Monmouth-Carmarthen-Fishguard) meets the north-south A470 (Cardiff-Merthyr Tydfil-Llandudno). The nearest airport is Cardiff Airport. The Monmouthshire and Brecon Canal runs for 35 miles (56 km) between Brecon and Pontnewydd, Cwmbran. It then continues to Newport, the towpath being the line of communication and the canal being disjointed by obstructions and road crossings. The canal was built between 1797 and 1812 to link Brecon with Newport and the Severn Estuary. The canalside in Brecon was redeveloped in the 1990s and is now the site of two mooring basins and Theatr Brycheiniog. The bridge carries the B4601 across the River Usk. A plaque on a house wall adjacent to the eastern end of the bridge records that the present bridge was built in 1563 to replace a medieval bridge destroyed by floods in 1535. It was repaired in 1772 and widened in 1794 by Thomas Edwards, the son of William Edwards of Eglwysilan. It had stone parapets until the 1970s when the present deck was superimposed on the old structure. The bridge was painted by J.M.W. Turner c.1769. Mount Street – in September 1864, with Llanidloes by the Mid Wales Railway which linked to the Midland Railway at Talyllyn Junction. The three companies consolidated their stations at a newly rebuilt Free Street Joint Station from 1871. The Hereford, Hay and Brecon Railway was opened gradually from Hereford towards Brecon. The first section opened in 1862, with passenger services on the complete line starting on 21 September 1864. The Midland Railway Company (MR) took over the HH&BR from 1 October 1869, leasing the line by an Act of 30 July 1874 and absorbing the HH&BR in 1876. The MR was absorbed into the London, Midland and Scottish Railway (LMSR) on 1 January 1923. Passenger services to Merthyr ended in 1958, Neath in October 1962 and Newport in December 1962. 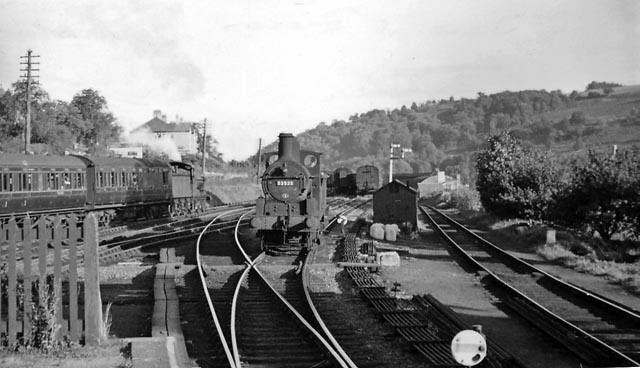 In 1962 the important line to Hereford closed. Therefore, Brecon lost all its train services before the Reshaping of British Railways report (often referred to as the Beeching Axe) was implemented. Brecon hosted the National Eisteddfod in 1889. August sees the annual Brecon Jazz Festival. 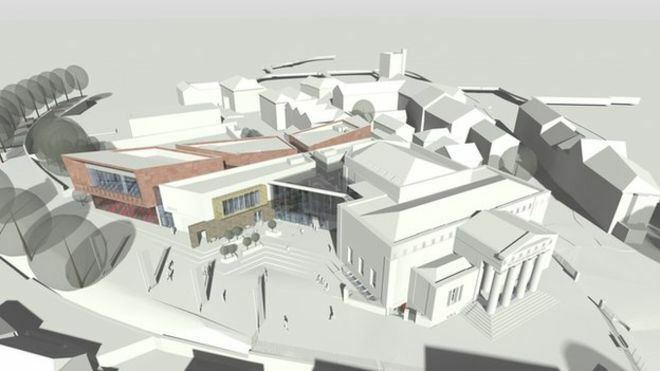 Concerts are held in both open air and indoor venues, including the town's market hall and the 400-seat Theatr Brycheiniog, which opened in 1997. October sees the annual 4-day weekend Brecon Baroque Music Festival, organised by leading violinist Rachel Podger.